Rodney Yee was my first Yoga teacher and he showed me this sequence in the late 90s when we were teaching in Toronto, Canada. BKS Iyengar gave this class in Pune, India in the mid 90s and Rodney taught it to a few students. 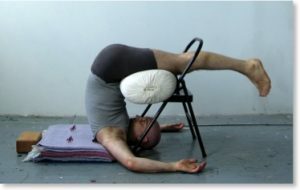 This sequence is quite advanced and requires a strong practice of inversions. Please note this post is informational, and I do not advise you try this unless you are comfortable with ALL of the poses. 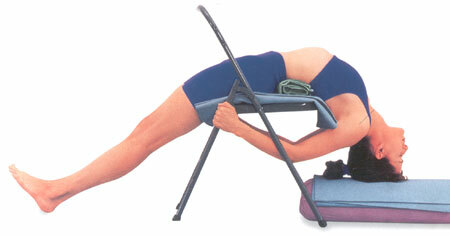 This sequence is for very experienced practitioners, especially with the long head stand. Please be aware of your own body and modify accordingly, especially for your neck and shoulders! I have practiced this complete sequence only a few times over the years and it does provide a very profound residue in the mind body connection. Thanks for sharing this, Cora. I can’t wait to try it. I think it will offer a much-needed reduction in my stress level. ooohhhh. Labor day weekend staycation retreat into this sequence is calling! ah, not quite at that 25 minute headstand yet… or even relatively near. 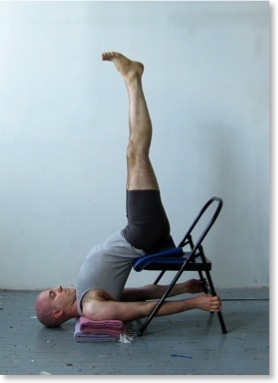 Occasionally practicing this sequence at my Iyengar class. A lot of observation, awareness & breathing under a relax mode – yes, this class is great.